A Summer in Georgia with AGCO | Be the One. A summer of personal and professional growth was one I had this year interning with AGCO in their North America Marketing – Communication and Public Relations department at headquarters in Duluth, Georgia. 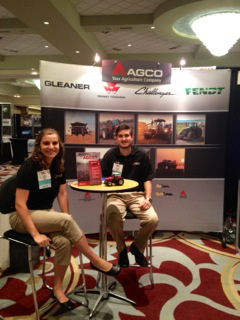 I had several large projects this summer that helped contribute to the success of AGCO. Whether assisting with an internal global brand rollout or participating actively in an upcoming launch for the new state-of-the-art Dealer Portal, I was able to provide knowledge and input as a team member. I personally contributed to these projects and other program launches by initiating communication plans, writing content pieces, activating the plans and creating surveys to measure success. I traveled to Jackson, Minnesota to visit the plant and tour Intivity Center for a media event. This opportunity allowed me to interact firsthand with agriculture media and see the pride AGCO employees have in these Jackson built machines. Although just a few of my projects, I had a well-rounded and worthwhile internship. Not only did I spend my summer being a tourist in Georgia but also AGCO did provide several unique experiences that I’ll never forget. Eating lunch with the CEO or driving a Challenger tractor during Ride-and-Drive definitely was memorable experiences from my summer in the south! This summer was more than just an internship for me. It was a chance to see the future of agriculture as my career and why agriculture is in such an exciting time with equipment, technology and feeding a growing population. AGCO allowed me in this internship to make it “Your Agriculture Company” in the sense of my projects, company contributions and personal takeaways. I’m thankful for this summer internship opportunity I had and know that I will be using the resources that AGCO provided for my future career in agriculture. Posted by Michelle King at 3:52pm September 9, 2014 Posted in Internships. Bookmark the permalink. Thankful for my home away from home.